Now we're talking. 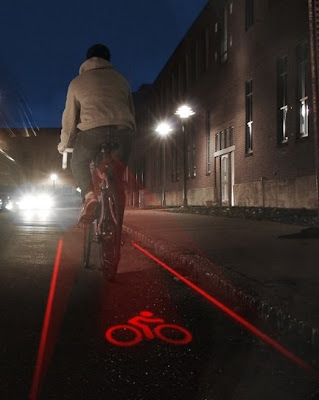 The Lightlane is 'Instant Copenhagenizing' where the bike lane follows you wherever you may ride, projecting a bike lane with red lasers on the asphalt. The idea is from Altitude in the States. Until your city or town councillors dish up the cash for safe, separated bike lanes, this is fine alternative. Thanks to Joanna Goddard for the illuminating heads up.